I have made many softies (soft toys) over the years and have countless books with different patterns but my go to book is The Big Book of Softies published by Penguin books. The most pattern I have made from the book is Polly. She is a really basic doll and she is my go to dolly for little girls but I make her without the ears. She makes a great 1st birthday present as she is cloth doll without any buttons or things that could be choking hazards. 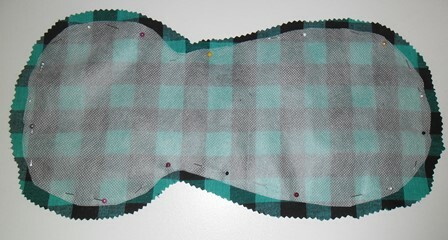 This pattern is great for using up scraps because you can make each section out of different fabrics. For the body it is basically a square rectangle with a little curve over the head area. I have added hair before using yarn but I have also made it without hair. 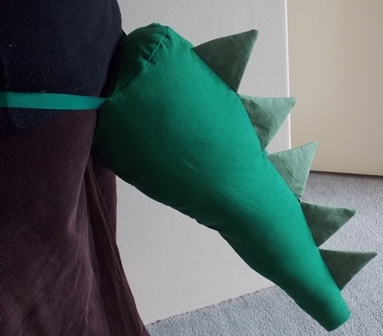 I am actually planning to make another Polly in the coming months for a gift. Looking back I have made the Gnome. I thought I had a photo of it as I made it purple but I can’t seem to have. Sometimes I make things and forget to blog about them. The Lizard was another pattern that I made from this book. Not everyone has a pink lizard but at the time my niece was liking the colour pink and like reptiles so this was a good combination. 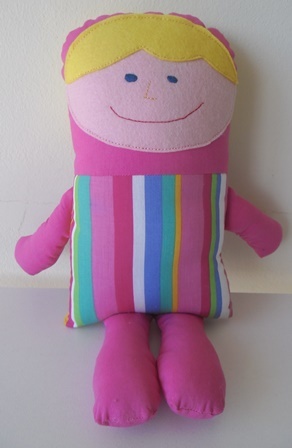 That is the best thing about toys that you make you can make them in the combination that you need for that child. 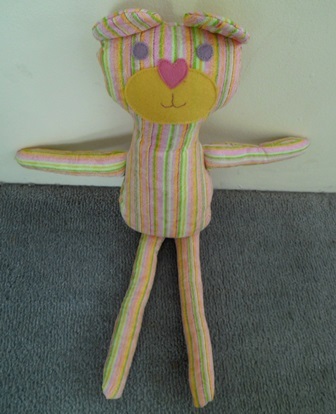 Another pattern I have made is Maisie. 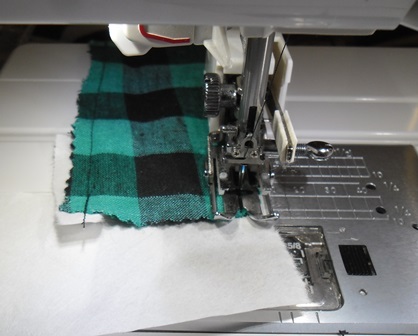 Again this is a great scrap busting project because you can make the different sections in different fabrics. This pattern is for more your older child if you add the buttons on the ears, you could make it for a young child without the buttons. My most favourite toy I have made from the book is the Car and Caravan. As soon as I saw this pattern in the book when I purchased it I thought of my childhood neighbours and the caravan they had. I made this for their great grandson. This is a very sentimental toy. The instructions in this book are very easy to follow. 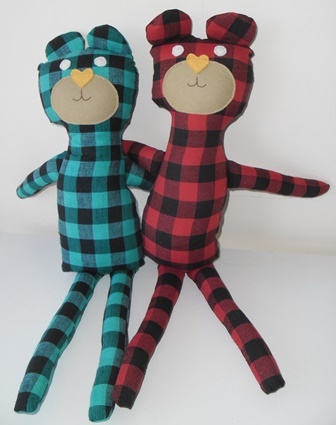 The pattern pieces list what size to photocopy them to but you can easily make the toys larger or smaller by photocopying them at a different amount eg 120% not 100%. This book doesn’t just have toys to sew but also some to knit and crochet. 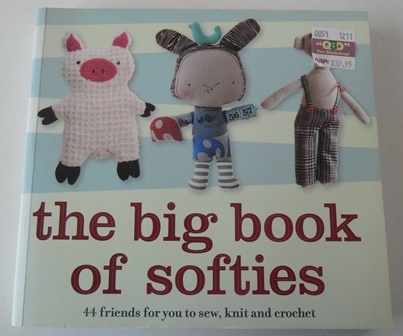 It is a really comprehensive book to have in your stash if you are thinking of making softies. 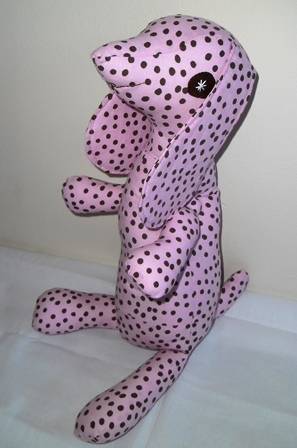 Polka Dot Pup is based on Madame Sausage by Ric Rac. I have had this pattern in my stash for a number of years but never got around to making it. I say Polka Dot Pup is based on the pattern as I haven’t done it exactly like the pattern. The pattern has little Miss wearing clothing, I used polka dot fabric I found in my stash instead to create interest, had I just chosen a plain fabric I think she would still looked ok. This polka dot fabric I was finding hard to use in any project so it was good to use it in this. Sadly little Miss sat in pieces for weeks (or maybe a month or two) before I recently had a deadline and finished her. It didn’t take long to stuff her and attach her arms. I think she is rather cute looking. Did I learn anything from this project? Yes don’t put off doing the finishing a project. Had I not put her aside once she was assembled I could have had her finished in no time. I suddenly put myself in time pressure to finish things for a deadline when I didn’t need to had I finished them in the first place. Sometimes I have the attention span of a fruit fly and jump from one project to the next but that sometimes (ok often) means I don’t get projects finished. I think I need to stop and refocus and finish things to the end so I get them completed and off my to craft list. I have mentioned before I have an owl loving niece. 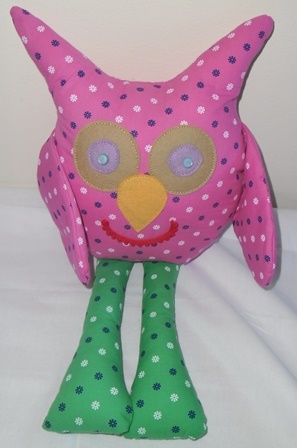 I’m always looking out for new owl patterns so I can make her a different one each year. Sadly this year the pattern I chose wasn’t working for me so I put it in the naughty corner and this little guy came to the rescue. 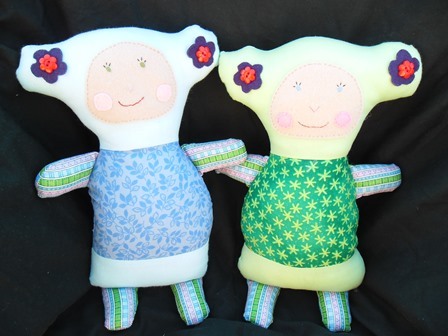 I made this pattern for this years Softies For Mirabel toy drive. The pattern is Simplicity 1549. I found this fabric in my stash and thought it was perfect. 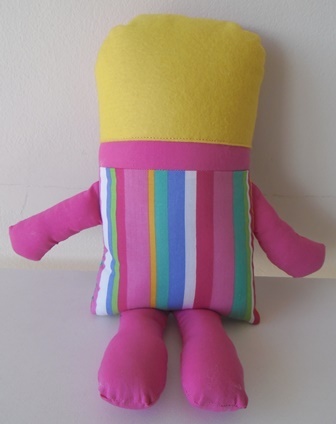 The fabric is very crisp so it holds its shape for the toy well. I really like how it is the same print but in the contrasting colours, the print isn’t too distracting either. Once again I added pellon to inside the wings as you don’t stuff them. For the face I thought she needed lips so I added pom-pom trim and for the eyes used flat front shank buttons. Sewing wise this was a really easy toy to whip up as the pattern pieces are very simple. 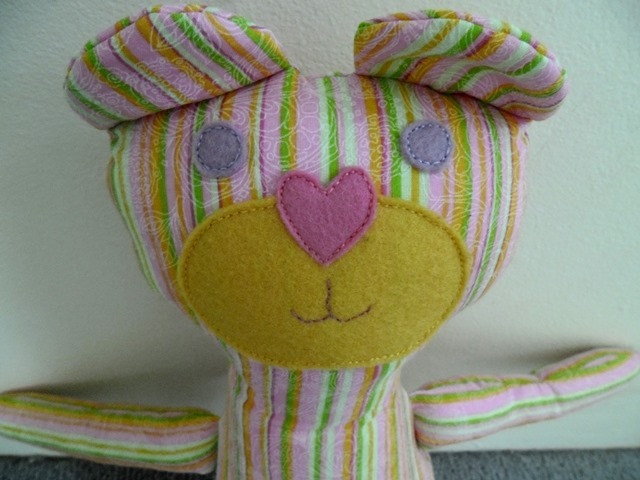 If anyone is after a really basic soft toy pattern this would be a great pattern to get started on as there not too many pieces or difficult construction. I am sure I will make this toy again.